Optus Travel™ makes it easy and affordable to connect to the Internet on your tablet or laptop using your mobile broadband device. When you leave Australia your mobile broadband usage is charged at roaming rates. These vary from country to country. To enjoy the convenience of mobile broadband data and have peace of mind, follow these steps. Ensure your Mobile Broadband service is activated for roaming. Determine the roaming rates in the country you are travelling and, if you need to, purchase an Optus Travel™ Data Pack or an Optus Prepaid Travel™ Pack. Check your roaming usage in My Account. If you are on a monthly mobile broadband plan, you can pre-purchase an Optus Travel™ Data Pack for $10 per day to get 200MB of data to use in Zone 1 countries. Need even more? No sweat. You can buy multiple days and accumulate the total data allowance. For example, buy 5 days and use your 1000MB any time over the 5-day period. Via My Account (Just click the options and extras tab). Call 1300 300 937 (within Australia) or +61 2 8082 5678 (free from an Optus mobile). Optus Prepaid Travel™ Pack is available in selected countries and has a 30 day expiry. 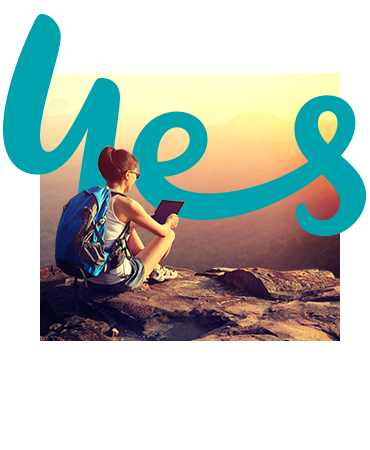 Find out more about Optus Prepaid Travel™ Packs. Frequently asked questions for Roaming on Mobile Broadband. For more answers visit our Roaming Help & Support section. HOW DO I ACTIVATE ROAMING ON MOBILE BROADBAND? 1300 300 937 within Australia or 133 343 if you are a Business customer. Local charges apply. +61 2 8082 5678 from overseas (free call from your Optus mobile). International Data Roaming for Mobile Broadband will activate within 4 hours. Just remember, you'll need to turn your device off and back on again to update the service access. WHAT ARE THE MOBILE BROADBAND ROAMING RATES? You can estimate your mobile roaming spend before you go by checking out our easy-to-use international roaming rates finder. All Optus Travel™ rates are in addition to your mobile broadband plan's included value. CAN I GET MORE DATA WHILE OVERSEAS? Yes. To get more data overseas, pre-purchase an Optus Travel™ Data Pack if you are on a mobile broadband monthly plan. If you are a prepaid mobile broadband customer, you will need to purchase an Optus Prepaid Travel™ Pack in order to use data while roaming. HOW DO I TRACK MY USAGE WHEN ROAMING? Optus customers with a mobile monthly plan can keep a tab on usage in My Account as well as receive SMS usage alerts. SMS alerts are not available on all business plans. If you are a business customer and want to check if your service will receive usage alerts while roaming, please call 133 343 within Australia. If you're a Prepaid customer you can check your balance via My Account. You can also SMS the word "BAL" to 9999 (no charge). CAN I STREAM MOBILE TV AND MUSIC WITHOUT USING MY DATA WHEN I'M IN OVERSEAS? No, data free Mobile TV and music streaming is only for use in Australia. You’ll be charged roaming rates for data used if you stream from our Mobile TV streaming services while you’re overseas and for data used with any music apps when overseas. Optus Travel™: Roaming charges are excluded from your plan's included value. The countries and services where Optus Travel™ is available may vary from time to time. Rates may change fairly frequently due to international exchange rates and what we are charged by overseas providers. We'll try to keep you informed of current rates on our website. Optus makes no guarantee regarding the quality and availability of coverage or any roaming services. Optus Travel™ Data Pack: Only for use within Zone 1 countries. Data is charged in 10KB increments. If you exceed the data limit, standard data roaming rates for the country you are in will apply. Optus Prepaid Travel™ Pack: Not for use within Australia. Maximum data allowance on the Optus Prepaid Travel™ Packs at anytime is $18,500, provided your recharge hasn't expired. If you recharge over this amount you will forfeit any data over the $18,500 limit. Unused credit will rollover when you recharge before credit expiry. Roaming data is charged in 10KB increments.